Apart from certain stylistic keys, I've always had a harder time dating men's clothing. It's just not as interesting to me, so I haven't taken the time to really study dated extant pieces and images and improve my skills. But lately I've come across more undated waistcoats while cataloguing - it's become something that I need to work on. And how better than by putting together a blog post? 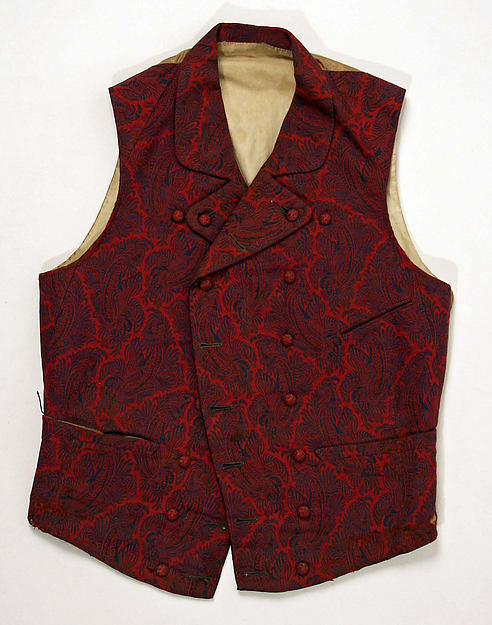 At the beginning of the century, fashionable waistcoats were cut straight across at the bottom to match fashionable coats, although the vests often protruded slightly below the waistline of the coat. High collars, also matching the coats, would cover the sides of the shirt collar that extended up to the jawline. Both coats and vests could be single- or double-breasted, generally with self-covered buttons. While coat lapels were generally wide, waistcoat lapels were somewhat narrower. Around 1814-1815, the fashionable male figure began to have a distinctly nipped-in waist, which could be reflected in the cut of the waistcoat or in padding added to the chest. Emphasizing this, they would generally be buttoned only at the bottom, the shirt's jabot bursting from the opening. The waisted effect increased and continued through the 1820s, though the fashionable waist was located lower toward the end of that decade. 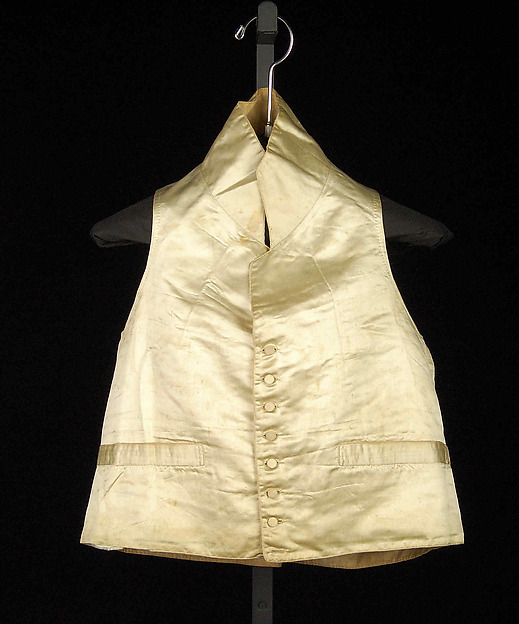 At first the trend of only buttoning waistcoats around waist level had no effect on cut, but at the end of the 1810s the construction changed: buttons and buttonholes were placed only on the lower half or two-thirds of the opening, and the front edges themselves might be cut on a curve so as to keep the lengthened lapels narrow all the way up, with only a slight notch. The bottom edges of the vest remained horizontal for most of this time; around the middle of the 1820s, they were cut with a slight curve to create separate points at the opening below the buttons when worn. As the puff of the chest was emphasized more at the end of the decade and the front edges were curved more, the lowest button was left unbuttoned and the points were then larger. 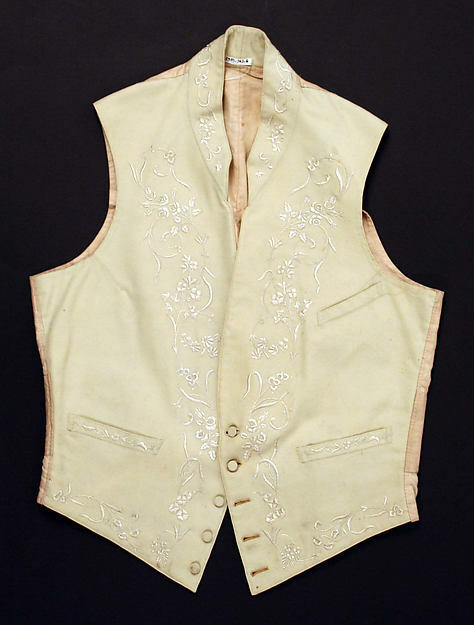 However, these points didn't last very long - by the very early 1830s, it was more common for the fully-closed vest to end in a gradual slope to one point, or simply a straight line, the latter especially if the waistcoat were double-breasted. Very little change occurred over the rest of the 1830s, but the unnotched shawl collar began to be more prevalent at the end of the 1830s; the angled breast pocket seems to have begun to appear between 1840 and 1845. Lower points without buttons reappeared after 1840 as well, whether single- or double-breasted, and while very narrow lapels remained in use wide ones were seen as well, more and more frequently toward the end of the decade. Early in the 1850s, the points dropped out of favor for a flat lower edge: at first with some space below the lowest button to create two wide points, then a completely straight line around 1855. While a deep opening to reveal the shirtfront remained in use, especially in evening dress or at home, for day dress a higher neckline became more common around 1855 as well. By the end of the decade, when buttoned high a waistcoat could have no lapels at all. The greatest change in the mid-1850s was that a pinched male waist was no longer fashionable. The chest was still to be rounded, still enhanced with padding, but the defined difference between waist and hips was smoothed out. Vests less commonly flared below the waistline. In the early 1860s, slight points reappeared at the lower edge of waistcoats, and the shawl collar began to be set aside in favor of either no lapels or notched and pointed ones. Formalwear fossilized to an even earlier shape, with shawl collars and deep necklines. White and black fabrics were the only ones used - for, respectively, white and black tie. Oooh, this is a great overview, thanks! I'm super-fuzzy on menswear myself (I guess that's cause I don't have anyone to put in it, haha) but I still like learning about it! Do you happen to have any ideas as to why there were the changes you mention ~1860's? Why the 3-piece suit became A Thing?